Now that I have started I have created new thread here. 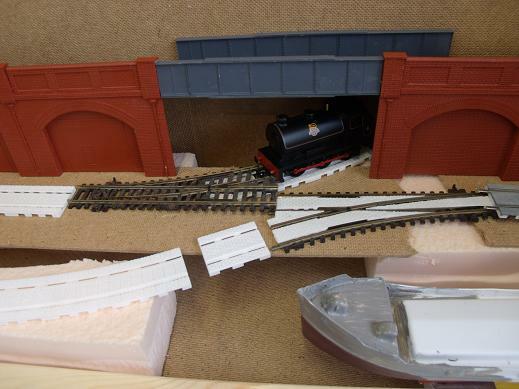 I don't normally do step by step reports, as they seem to doom the project, but willing to try here, as this project is partly to show off my new 3D printed inset track. Building it in an Ikea APA box, well two actually. One will be HO scale the other OO gauge. Thinking up names normally follows a theme for me, and as APA is Swedish for ape or Monkey, I thought the OO module would be called Monkey Island and the French HO version would be Isle de Singe. Started on Isle de Singe first. The two modules will share same fiddle yrad space but not be actually connected. I want to demonstrate to less experienced exhibition visitors the difference between OO and HO. That's a nice start, Simon. Interesting buildings, too. What's planned for the other end, I wonder? If I'm not careful that track plan will start to give me ideas. Just as well there seems to be no excuse to visit Ikea just now. Finding Mediterranean building kits in HO is difficult. These are modified Italeri ones which are strictly speaking 1/72 scale. The other module uses a mixture of Wills and Miniart models. As I picked up a Hornby 2-Bil in Southern livery very cheap, I plan to add a track on higher level at back so 2-Bil will shuttle back and forth. Its a tight deadline as I plan to take it to a small local show in January. Sounds good - a two level arrangement works well to make a small space look more important. Good luck with the deadline. Looking forward to more photos eventually. Playing WW1 trains this weekend at Apedale. Will be able to concentrate on OO/HO from next week hopefully. The inset track panels are quick to install. Wiring etc takes a bit of time, as I double up on everything. Plastic buildings should not take long to assemble, The goo I use to make the water can take a while to set though. A boat I am building for the OO module is the only difficult item, and if it looks like it won't be any good, I will leave it out. A boat I am building for the OO module is the only difficult item, and if it looks like it won't be any good, I will leave it out. Boats are always of interest as they are relatively rarely modelled and even more rarely written about. Kit? Scratch? Kitbash? Don't keep us in suspense! Not sure how I can justify a Clyde Puffer down south in London or south coast, and might end building it in minor war damaged condition. Maybe Dunkirk evacuation. Sorry to hijack your post Simon, which I am following with interest. Giles wrote that boats are always of interest as they are rarely modelled. I have loads of photographs of real inshore fishing boats and other small working craft that I can post if anyone is interested. I will start a new thread if there is interest. It has been an interest of mine for very many years. That boat kit's quite tempting, isn't it! And a good price, as well, compared with the Langley Models kit, though that probably has a better finish. Were they really confined to the Scottish coastal waters all their lives, particularly given their war-time use? Giles...I believe......one or two may have got as far as the Bristol Channel? I have a book packed away somewhere, on the S&D Rly maritime operations..I seem to recall mention of a Scottish coaster in it? 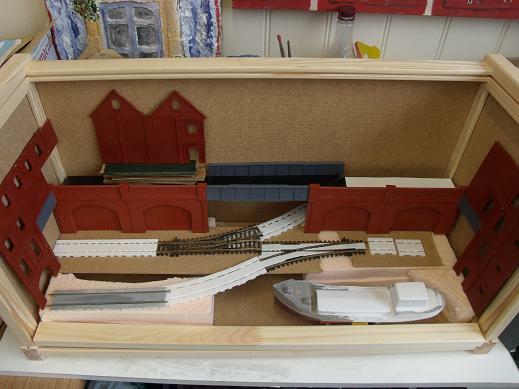 Oh..and there's currently a huge thread on Narrow Gauge Railway Modelling forum about ships & stuff.....I think well contributed to by Broadoak of above? One piece of advice on this boat kit, is that you need to provide some extra parts. The cabin behind chimney is clear plastic and I will make my own.The mast you have to make out of a couple of plastic rods and the rigging you need to work out yourself. I am thinking that it might be possible to make the bits using 3D printing. I wonder if Langley sell the detailing parts separately.Might be worth looking for cheap boat kits as they might have useful boat bits, even if they are smaller scale. I suppose that if Clyde Puffers got to Bristol Channel then they could have got to East and South coast. During World War I these handy little ships showed their worth in servicing warships, and were used at Scapa Flow, and for World War II the Admiralty placed an order in 1939 for steamships on the same design, mostly built in England, with the class name of VIC, standing for "Victualing Inshore Craft". After the war a number of VICs came into the coasting trade. .... so it seems plausible that a type similar to them could be seen along the South Coast? I like the Dunkirk 'back story', myself. plan to take box etc to workshop tomorrow(?) and get cracking. Just received latest order from Shapeways so I can put in order to track etc. I was waiting to see what latest batch of WW1 models looked like, in particular OO9 version of Joffre to see if it will fit chassis. started working on the 2nd module, OO scale, in my workshop. I am continuing to do the HO one at home, in my attic. The method I use to create the water can take a while to set. Searching for various boat bits and just bought the Revell tugboat. It is 1/108 scale, but cheap enough to use some parts. I have a bid on another, so might use that to build something for the HO module. working on the OO version - Monkey Island. 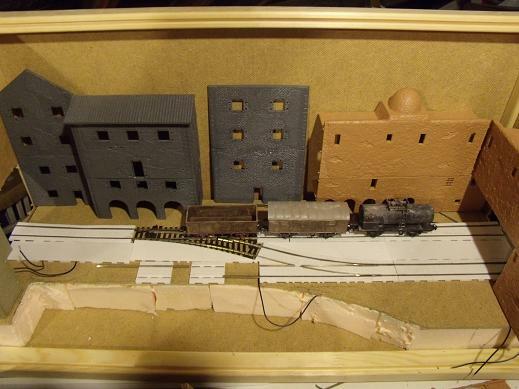 I might add more warehouse buildings, and a Townscene dock backscene.